Bus is the number one transportation for long distance journeys in Thailand. The country has a large bus network and there are numerous bus routes that you can choose from. 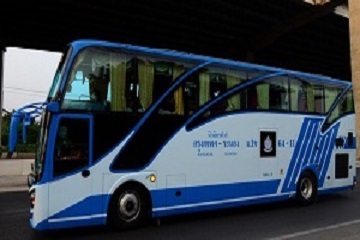 New Mitr Tour Thailand is one of the many well-established bus companies that had managed to survive in the present competitive bus operator industry. The company is based in Rayong, which is the capital city of eastern Thai province on the Gulf of Thailand. This city is well-known of its national parks and beautiful beaches. Witness it for yourself when you book your bus tickets with New Mitr Tour Thailand through Easybook's website here. Buses for New Mitr Tour Thailand are mostly single deck with 24 and 32 seats, which you choose from when you book a bus ticket on our website. The company is using "2+1" seating arrangement for their 24 seaters rides while their 32 seater's buses get the "2+2" arrangement. New Mitr Tour bus coaches come fully air-conditioned and equipped with comfortable seats to assure their passengers have pleasurable bus trips with them. New Mitr Tour Thailand is offering bus routes that start from Southern Bangkok Bus Terminal to Ranong Bus Terminal with return route as well. The New Mitr Tour buses mainly travel between these two terminals. Southern Bangkok Bus Terminal or also known as Sai Tai Mai which means "The New South Line" is located northwest of central Bangkok, on the left bank of the Chao Phraya River along Borommaratchachonnani Road. Southern Bangkok Bus Terminal serves as the departure point for all buses in south of Bangkok and transports to Kanchanaburi and western Thailand. Before taking the New Mitr Tour bus that depart from the terminal, you can do some shopping or have a meal in Southern Bangkok Bus Terminal as there are many shops and restaurants in there. Ranong Bus Terminal is a small bus terminal with capacious prayer rooms, spacious waiting area and mini marts in it. The terminal is also one of the main traveling point for New Mitr Tour Thailand. Ranong Bus Terminal is located at Tambon Bang Rin, Amphoe Mueang in the province of Ranong. Don't worry if you don't have a pick-up upon arriving at Ranong Bus Terminal because there are pick-up trucks called Songthaew ready to take you to your destination. Kick start your journey from Bangkok to Ranong or vice versa now! Booking New Mitr Tour bus ticket online at Easybook website or mobile app is the start of your perfect journey.